More than 500 Washington Elementary students, parents and staff members gathered on Feb. 5 to celebrate the launch of its Positive Behavioral Intervention and Supports (PBIS) program, which helps create a positive school setting through strategies that define, teach and support appropriate student behaviors. While Washington is the first San Gabriel Unified school to implement the program fully, Jefferson Middle, Wilson Elementary and Roosevelt Elementary schools also use PBIS strategies on campus. Students, parents and District officials visited stations throughout campus that highlighted the “The Washington Way,” such as classroom behavior expectations, playground etiquette and arrival and departure safety tips. 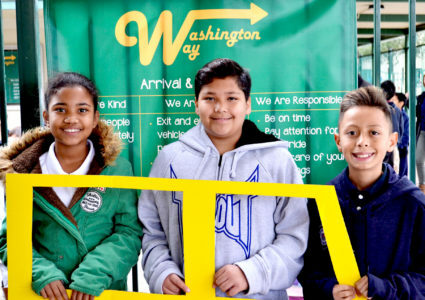 Each station featured “Cool Tool” videos or presentations created by Washington students and teachers. Washington Principal Sandra Dunville said that teachers and staff have worked hard to implement PBIS strategies throughout every part of the school day, and that negative behavior has decreased on campus since the strategies were introduced. SANGAB_WASHINGTON_PBIS: Washington Elementary students learn safety tips for arriving and leaving school during the PBIS kickoff event on Feb. 5.